This year, we’re not doing anything too radical for Christmas. Four services on Christmas Eve and that’s pretty much it. And—thankfully—it’s pretty much the same service we did last year (albeit with some new music and a slightly different band configuration). Our thinking was, it worked well, let’s not mess with it (much). To that end, we’re doing a very similar set. Whereas last year we used a lot of OSB, this time around it’s luan. For the last six months or so, we’ve had seven 4x8 flats upstage, lit by ColorBlasts. For Christmas, we’ve built a quasi-wall with them. The idea is to keep a woody theme to warm up the stage. The block wall provided a nice backdrop for our vocalists. To dress it up a little more, we built a 3D wood sculpture out of plywood and luan. 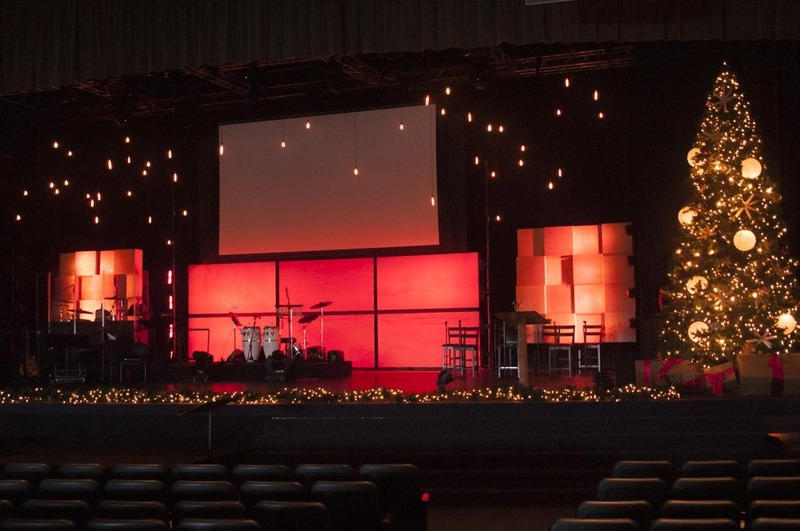 It’s based on the block wall concept our student ministries team built in their new room this summer--only bigger. We ripped 1/2” plywood into strips 3”, 6”, 9” and 12” wide. Those strips were then cut to length to make 2’ square boxes. After some glue and nails, we faced them with luan fronts. The boxes were then attached to a backer board (also 1/2” plywood) with nails and construction adhesive. Here's the wall with light. Four Flat Par 7s hit each block wall from the side, about 4' downstage of the wall. 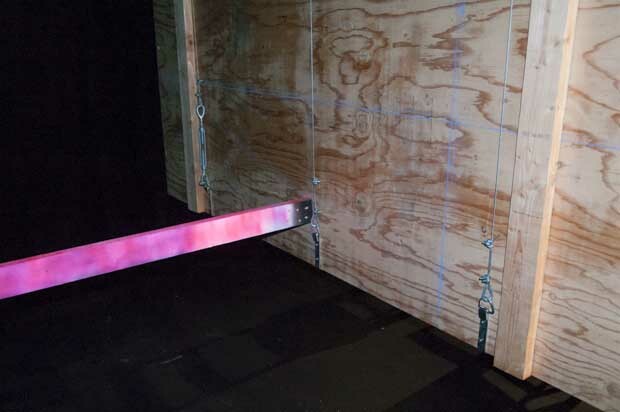 ColorBlasts lit the panels on the back wall. Another angle with a better view of the lights. 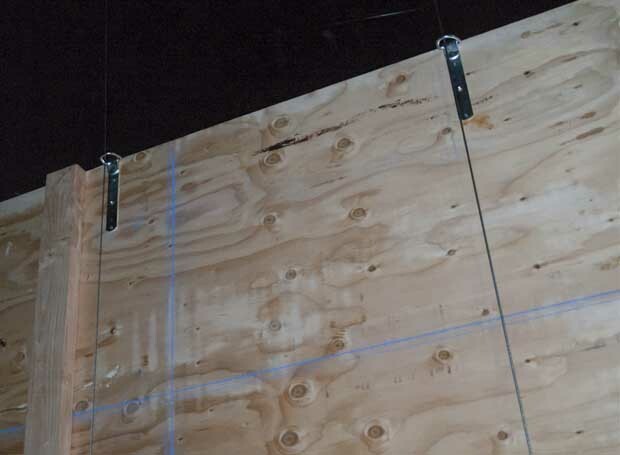 We bolted two sheets of ply together with 2x4’s to make two 8’ square walls. Once we had the sculptures, we hung them from the truss using aircraft cable. To attach the cable, we used a device known as a “bottom hanger iron”. Basically it’s a J-shaped piece of steel that gets bolted to the bottom of the flat and serves as a connection point for the cable. A “top hanger iron” sits at the top to keep the top of the flat close to the cable and basically upright. Bottom hanger irons. These can support some serious weight. We weighed each piece and totaled up how much each 8x8 was going to weigh, then designed our hanging system to be about 20 times stronger. Normally it’s suggested to do a 10x, but it worked out at 20 because I wanted to run three lines up to the truss for stability. To make it easy to level out, we also attached one of the cables per flat with a turnbuckle. That way, we could get it close with the cable clamps, then dial one side up or down with the turnbuckle to get it perfect. Of course, it’s only hanging about 18” off the floor, so that was pretty easy. Here you can see the turnbuckle we added to make leveling easier. Turns out, we didn't need it. We painted the brace bright pink to keep people from walking into it. So far, it's worked. Once we hung them, we noticed the center of gravity was higher than I anticipated and they hung forward. It wasn’t terrible or dangerous, but we didn’t like it. So we added a 2x4 brace to push the bottom out and plumb it up. 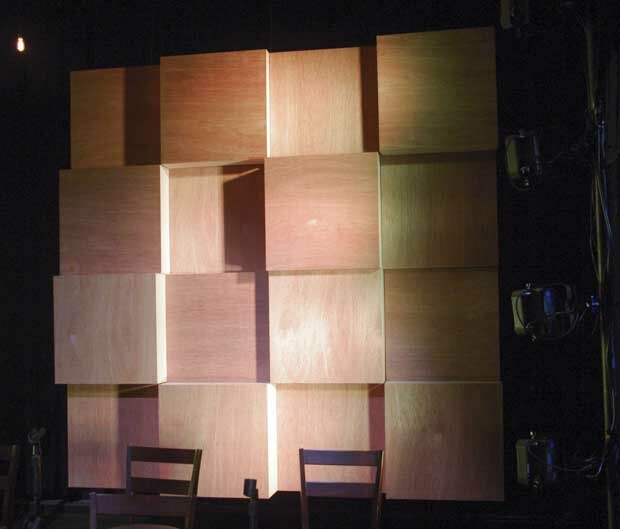 That also had the effect of pushing it slightly downstage of the back wall plane, adding a little more depth. The final effect in context. Of course, we also have our vintage bulbs hanging on bare cords like we did last year. Everyone liked the look, and we now have a good system in place to put them up, so it was pretty easy. Add one giant Christmas tree and some pre-lit garland at the stage lip, and the set is done!